The man lay in the tall grass on the crest of a long ridge overlooking the Savannah far below. He had lain there since the dark before sun birth, unmoving except for his eyes, which swept the plain continuously, even as his target crept without perceptible advance from the horizon. Insects and even a small beelwar had run across his outstretched legs as he lay. The small, furry body with its barbed tail had tickled the man's rough skin as it skittered across. The beelwar had even stopped to contemplate the man for a few seconds, standing with its tiny paws curled against the scales on its chest, its tiny yellow eyes curious, before it rushed off into the grass on its endless search for food. But now, the light of the suns threw double shadows lengthening from the few twisted trees that stood sparsely spread on the steep slope below him and the day creatures had gone to their burrows and nests. The man felt his skin tighten and cool when the sweat which had run unheeded down his face all day began to dry as the Sun Brothers began their long journey through death under the Lands. His business would be done by the time they were free again from the grip of the Underlords to be born anew and to cross Heaven on their daily hunt. The man felt the cool rise from the lengthening shadows of the grass. He had suffered under the Suns as they passed in their glory over the Lands. His throat felt as parched and hard as the dried kra'utam skin that he carried to make the chords that go soft in water and hard again and tighten so they can cut through the tough skin even of the living kra'utam itself. It had cost him great effort to get that skin. The kra'utam was taller than a man at its shoulder and with its thick, heavily wrinkled hide, great stomping hooves and seven sharp horns on its head, it was formidable prey. The man had trapped one with a snare made of woven lootu vines tied to the tree in which he waited. 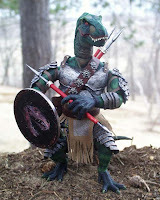 He had jumped onto the ridged backbone of the great beast and had stabbed and stabbed and stabbed with his assegai until he could penetrate the hide and thrust deeply to reach the life of the monster. The skinning and preparation of the hide had taken 8 suns. ”I will have the use of that hide before sun birth, if the Brothers will aid me,” the man thought grimly. Wet through and tightly tied around the wrist, kra'utam thongs would shrink and twist until skin and muscle and bone were cut through, but slowly, slowly. The wrinkled skin at his throat reddened and swelled slightly at the thought of using the thongs. He forced his mind away and his neck flap collapsed into itself, deflating into its usual pale and flaccid folds. With the rising dark came also rising the metallic creaking and soft susurration of the flying things that would bring more discomfort to his vigil. Even a man has soft places that their spiked and probing feeding would find. At the base of his tail, at the edges of the ridge of scales down his back and, most dangerously, directly in his eyes unless he closed his brow plates, which he could not do. Not yet. He could not make the blinding smoke that would keep them away, or slap or even move to cover himself with the silky fur of his nrakam robe. His enemy's eyes were sharp, sharper even than his, and a man's eyes are nearly as clear and far-seeing as those of the nraka themselves, that flew miles above the Savannah looking for death and the resulting feast. The slightest move could bring the shrieking thing even from where the enemy moved in the valley below to seek him and to destroy him and to rob him of his reward. The man had seen a whole hunting party of Others disappear in a cloud of fire and noise and black, stinking smoke. The only warning had been a shrieking as of the grottuk, when, pierced deeply in the belly by the assegai of a young hunter seeking his first man's scarring, it began its death dance, shaking the ground with each crumping stamp of its huge claws, swinging its great trunk and spiked tail while the hunter ran from beneath the great hairy underparts and keening and screaming with a falling note that could make a man's ears bleed if he were too close. The Others had heard the falling scream and had stood, confused, for there was no stamping or shaking, and this was not the year time for hunting the grottuki thus. And then, the cloud that had eaten them had risen into the way high and when the man had approached, all he found was the black and burning trees, the great wound in the earth, and the ring of red flesh flung out around the place where the Others had been. He had been seen by the nraka, he knew, as they whirled in great, sweeping arcs high, high above him, spots as small to his eyes as the grains of dust before his face. One had even circled down until it was no more than ten thousand paces above him and he could see the four great wings spread out to catch the rising air of the Savannah. He had moved a single finger, then, and the nrakam had soared away again. The nraka did not eat live meat, but he knew he was marked and remembered. He had sensed the nraka as they slid out of the way high into the sky and then down to sit without sleeping during the dark time in the stunted trees. “You will feast tomorrow,” thought the man. He did not grudge the meal. He would not be feasting this time on the meat of his enemy. The flesh was corrupted by the evil that had been done, and the man would be able to eat no meat until he had been given the Khrakheem purification by a priest, if any were left alive. There might be some of the People left beyond the Forest, and he could bear the slow starvation until then, or even stave off death for awhile by gnawing on plants or roots. He could kill without touching, which would save him from the contamination, but he meant to feel this death with his hands. Even if the swooping flight of the nrakam had been seen, the man did not think that his enemy would understand why it had come down and then returned to the way high. He thought they had seen; the nrakam had been high enough to be seen for many thousands of steps beyond the horizon, and he had been able to see that the spot that was his enemy had crossed that distant line before the nrakam dived and then climbed again. The enemy had far sight. Some said they could even see beyond the horizon, that they had magic that carried their eyes or their ears or their mouths far, far beyond where they were, so that they could see and speak to each other from great distances, without the talking smoke or the seeing glass. But the enemy were new to the Lands, and did not understand many things, despite their far sight or magic speech. Men could defeat the enemy using stealth and silence and the wisdom of men. The enemy had the roaring thing that could destroy him even so far as this, but he did not have wisdom. The enemy had come during the Dry Time of the year, after the great hunt that followed the Migration of the grottuki, when all the People and the Others as well laid the sliced flesh out to dry in the glory of the Brothers. It was a time of resting and visiting and great feasting. Many wives were made, and many eggs of the Young Ones were first quickened during this time. The man had been dancing on the beaten earth of the vletch in the center of the Village when an Other had run into the open space and ullulated the warning call that brought all within hearing to the vletch. The runner had spoken of the great smoke five thousand paces away near the entrance of the Valley. The man and the People and the Others had gathered into a great throng which ran, hooting with alarm calls, towards the smoke. They had gathered with wonder and horror at the edge of what had been a village of Others, seeing for the first time the emptiness and, in its center, the pile. The dark was coming fast, now. While his eyes would still be of use, the man checked once again his weapons laid ready to his hand. His assegai and knife were there. Each blade had been carefully chipped from the finest obsidian by his own hands, and he knew their sharpness and worth. Kra'utam skin would cut like the softest, furriest beelwar using those weapons. His throwing spear and bow he would leave here. Even the assegai was extraneous. It would be close work, knife work, and then only to disable. The kra'utam thongs would finish the job. The man turned the front part of his mind once more to the progress of his enemy. The back part of his mind had noted the slow passage of his enemy to the base of the long slope and had seen the stopping and the signs that the enemy would spend the dark time down below. That meant that the enemy did not know that he was waiting. Far below a spark glimmered and grew to a glow. The enemy had no dark vision and always made lights like little suns where he stayed at night. These lights were small, not the huge, bright lights that the enemy used when he felt danger near. The enemy must think that there were none of the People left in the Valley. The man thought back then, two days back to when he had returned to the Village from the hunt and found what the enemy had left. Only the bodies, cut and butchered like the meat he had brought back to share. His wives and small ones, the Others, all his people, gutted and dismembered then piled and burned. All the tents and huts gone, all the dried flesh and weapons, all the carrying baskets and nraka robes, everything belonging to the people had gone, leaving only the stinking pile, still smoking and wavering in the heat ripples that rose from the pile. He had smelt the roasting flesh long before he had reached the Village. He had thought that the Other hunters must have killed a nargil or even a grottuk to raise such a wonderful odor of feasting. He had hurried through the Forest with the hunger taste growing in his belly and mouth. He savored the flavor that the odor brought to him, and when he came into the clearing and saw what he had been tasting in the wind, he emptied his stomach again and again until he could vomit no more. He found the tracks of the enemy right away and he prepared to follow them. There could be no rites for his people. The bodies could not be properly prepared. Only the slow dying of the enemy could feed the spirits of his people, giving them the strength to free themselves from the grip of the Underlords and start their long and hazardous journey to the Star People. The tracks led from the Forest towards the Savannah and the wide Valley that lead through the Mountain and to the great Sea. The enemy had come from the Sea, the people said, and the Valley was the only way to return there. The man knew the Lands for many thousands of steps around the Village, and knew of a way to cut across the foothills of the Mountain to reach this spot overlooking the Valley. He and the Other hunters came this way each year at the time of the great migration on the nargili to the Sea. He had run without meat or drink for a day and a night and had reached this place before sun birth. He had lain in patience while the Sun Brothers made their hunt, and now the dark time had come and delivered the enemy to his hands. 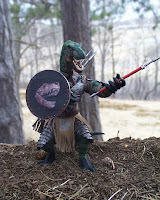 With the careful, inexorable movement of a chameleon approaching its prey, the man reached out for his weapons and then began the slow descent of the ridge towards his enemy. The last of the patrols sent into the forest of sector w-3 beyond the mountain belt was found this morning after failing to report as expected. All four members of the patrol were dead and exhibited signs of severe torture. The bodies had been scavenged by the flying creatures that serve as vultures on this world. There was no signs that the beasts, themselves, had taken or eaten any of the flesh. Although the tracks of the attacking beasts had been swept out, the rescue patrol estimated that there must have been at least ten animals in the attacking party to be able to overcome the patrol. No apparent resistance had been made to the attack. None of the guns of the patrol had been fired and all of the rockets were still in their launchers. The patrol had neglected to implement full electronic defenses, apparently in the belief that all beasts in the sector had been neutralized. A group of beasts must have escaped the neutralization and ambushed the party. Commodore Leary has ordered a full neutralization crew of fourteen vehicles back into sector w-3 to complete the cleansing process. Members of the patrol were Ground Sgt. Kenneth Cooper, Technical Sgt. Elyssa Brant, and Ground Pvts. David Harris and Edgar Kochman. Next of kin have been notified and the remains recycled. Reading Matt's fantasy tale, I was inspired to try my own hand at scifi. I am not a huge SF fan, but have read some, from Verne to Asimov. Some of the elements of the tale are clearly derivative; it's hard to be entirely innovative on one's first try. Still, I think this is a nice little story, rough and incomplete, but nice. I hope you enjoy it. BTW, I have included my own image of Kreelakh. 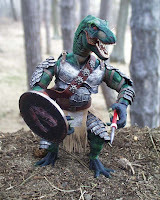 This was a figure I customized out of a the head and legs of a toy Tyrannosaur and the torso from a human action figure. The story actually started out as a straight Western/African/who knows story, and the SF bits worked their way in over several revisions. The enemy did not get its human twist until rather late in the writing process, which turned this from straight adventure to moral commentary. Enjoy! It is enjoyable once I shift gears a little to the sci-fi realm. You have done a good job of creating the setting and identifying the emotion and motivations of your characters. I have made an attempt at ?poetry? - I think this is has a better chance at being the piece I will submit because "Mama and Daddy" and "Life on Avalon Lane" have no clear direction in my mind, or on paper. Let me know what you think. That was another tip o' the hat for Matt - Remember that he likes the Beat poets (as do I!). I just mixed the first names up. Plath wasn't Beat, of course, but I needed a female. Wow, David, what a piece! I love the photo. Your imagery and choice of words, as always, are terrific. As someone who does not read sci fi, I found it hard to figure out what was going on in the first half of the story. I am thinking that including the photo of the character at the beginning or somewhere in the text may have given someone like me a better shot of figuring it out. Then the log entry heading then distracted me. Have you considered not using that and just continuing your tale? I think this story would be appealing to sci fi fans. Could be one of many in a series... I can easily see a movie version too. David, To Emily will be my piece. Please check out the revision I made based on the comments from you and Becca. This is a literary device similar to irony. The ambiguity about the identity of the "man" is purposely ambiguous. There are hints from the beginning that the "man" is not human, though at the cultural and technological level of our own Neolithic hunter/gatherer phase. The identity enemy is also purposely ambiguous, although hints of the superiority of it's technology are given. I am trying to build the image of a man lying in wait for revenge, and bring out bits and pieces of the background as the story progresses. The picture I hope that the reader has is of an invasion of the Lands, as my hero calls them, by an advanced civilization which is engaged in genocide of the current inhabitants. The last paragraph is sort of the whole point. The enemy is human and they see the destruction of the existing inhabitants as cleansing. The tone of the log entry indicates that the whole operation is being done in a totally cold-blooded fashion. Even the "recycling" of the human dead indicates the icy efficiency of the commanders, at least. The photos are just for fun. The reader must form her own idea of how the "man" looks. The last paragraph hopefully caused a kind of wrenching re-alignment of your picture of what was going on. If this didn't happen, how do you think I could make it more effective? I should actually remove the photos and change all the human names. I was being to cutesy, and I think that lessens the impact of the last paragraph. Here is a page that claims to have all of his stories on-line. This is great stuff! Obviously, I love the "fantastic" ideas and concepts presented in the writing. One thing I think you could do better is give your reader's more description of the beings you've created. I liked how you italicized the names of the creatures you created, but I wanted to know more about what they looked like, inside and out. For example, I know you have read Tolkien based on the comments you left me, and I'm a huge fan of his writing, as you guessed based on my story. Tolkien might go into a history of the creature or explain why it looks and acts a certain way. I can tell you have a lot to write about for this story, so why not give your readers more details, details and details! Great work! Dave, I especially like the log entry at the end. It is a clever way to give some information about what time period you're writing about. If I had one piece of criticism to make it would be that I'd like to know more about the history of the characters. Good luck publishing!